The game started out slow, grew more hectic as time went on and exploded at the end. Borussia was superior and could have killed the tie several times, but made tactical mistakes and did not finish well, as in the first game. In the end they forced what could not be achieved with play. Tactically it went down as follows. From the beginning it was a different game than the first leg, because both coaches adjusted. The most important change was the away team’s, where Pellegrini managed to stabilize his defence. Malaga’s four attacking players, usually somewhat separated from the deeper group of six, abstained from pressing high up the pitch. They positioned themselves in a flat line in front of the double pivot, so that a kind of 4-2-4-0 defensive formation arose. 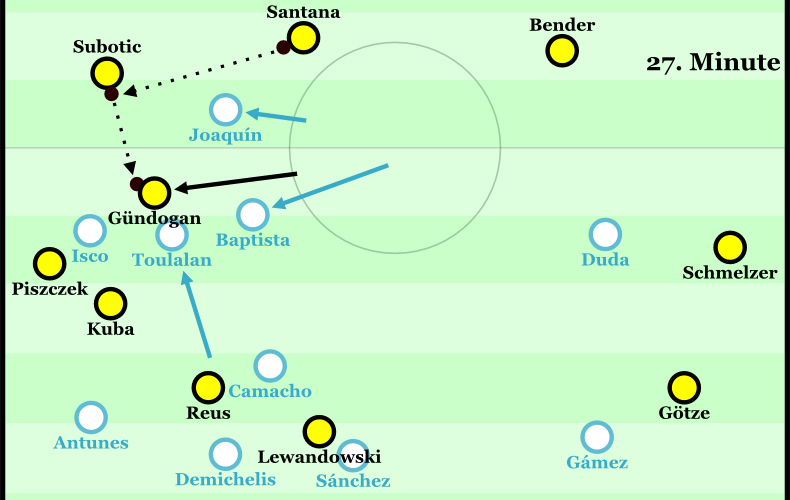 Due to this tighter formation the Andalusians succeeded at pushing the BVB build-up out of central midfield, an area in which the Germans were allowed to do anything they wanted during the first leg. Especially the positioning of the two nominal forwards Joaquin and Baptista was remarkable. Mostly they did not block the connections towards Dortmund’s two players on the six, but lurked close by. They left space for the pass, but were so close, that the pass was just risky enough for Dortmund not to play it. They virtually created a threefold covering-shadow cone, because they were not only able to cover the space behind, but also between themselves. Malaga exploited the technical weaknesses of Subotic and Santana this way. The two were extremely keen on avoiding bad passes and breaks. Joaquin and Baptista do not close the channel, but Santana does not want to risk the pass into the pocket of space. Toulalan and Camacho are able to adapt to the movements of the badly staggered Dortmund attack. Camacho and Toulalan played fairly freely behind this first line and adapted an option-based man coverage against Borussia’s movements. Mainly they watched spaces in front of defence and made areas overcrowded by Dortmund players tighter. If necessary they also advanced anticipatorily. Often they denied Dortmund’s midfielders the opportunity to turn toward the pitch and forced direct back passes into defence. Gündogan accepts the ball from the side from Subotic. Toulalan predicts the situation early and Gündogan, surrounded by four men, can’t turn and work with the ball. As a result he returns the ball to Subotic who plays a weak long ball. 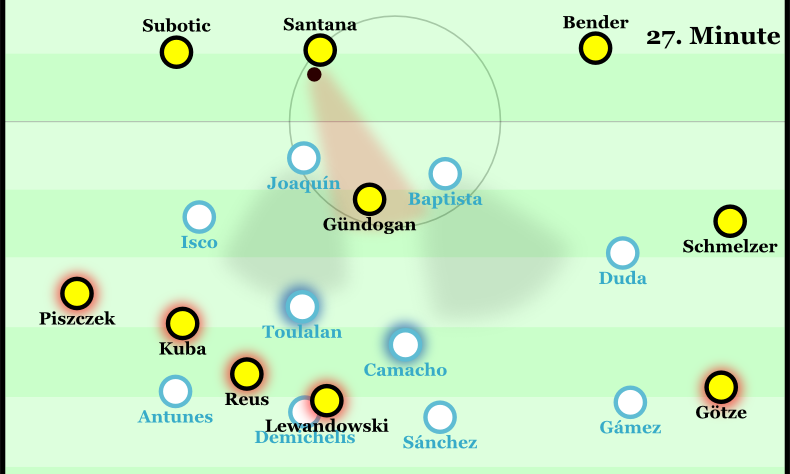 In possession Dortmund’s defence consisted of a bank of three, because Bender or Gündogan supported the centre backs and dropped towards the middle or to the left. The fullbacks in turn advanced earlier than usual, probably to exploit the high positioning of Malaga’s outside players. With Götze moving freely through midfield a 3-4-3 formation resulted, within which the central positions and the third defensive position were occupied by different players at different times. The BVB did not play this formation well though. For example, Gündogan’s swerving to the side was not as effective as is often the case against 4-4-2 formations. One reason was that Malaga was fielding a 4-2-4 rather than 4-4-2. The wing-players were closer to the forwards and were able to cover the diagonal passing options. Similarly the forwards covered the vertical options. Another reason was Dortmund’s weak advances into the second and third line. Reus, Lewandowski and Blaszczykowski took up positions far to the side and very high up the pitch. Götze, too, was not constantly present, because he moved impatiently and let the central spaces lie barren time and again. Santana manages to pass the ball through the channel, but Toulalan immediately pressures Bender. Camacho has no problems taking care of Götze. Reus und Blaszczykowski have no impact. Reus could have received the ball into half-space, but Duda intercepts it instead. Symptomatic: Gündogan completed 17 passes in the Dortmund half during the first 45 minutes. Although they were all successful, not a single one of them (!) was played forward. Götze also dropped deep during longer spells of possession and even had eleven passes from the left fullback area, but they too were all to the side or backwards, with the exception of one long ball out of play behind the goal-line. Malaga cut off the opening pass well. Even if it reached its player, there were barely any opportunities to continue play in defensive midfield. Too rarely did the men in yellow carry play into the central attacking spaces and so they were neither able to exploit the high position of their fullbacks nor the relatively aggressive positioning of the wingers. Dortmund’s main threat were long balls to Lewandowski, whose ball retention was world class. In that situation Malaga’s relatively high defense was susceptible to quick passing, especially because Dortmund was more active hunting second balls and anticipated them better. The results were meagre anyway. During the first 30 minutes Dortmund managed only one attempt on goal. The same was true for Malaga, even though the Spaniards scored immediately on their first try. With the exception of a free kick it remained the sole attempt by the away team, who were actually threatening even less than Dortmund. One of the reasons was that few of Malaga’s players advanced in possession. Antunes and Gámez were more cautious than during the first leg and Malagas double six is very defensively minded anyway. Dortmund’s quality pressing was rarely needed. Isolated shifts of play to Gámez when Reus was pressing were slightly dangerous, but the movements of the “fake” pair of forwards (Joaquin winger, Baptista ten) did not impact the run of play much. Malaga was clearly defending against breaks first and foremost, they wanted to create scoring opportunities after dispossessing Dortmund. Dortmund coped well this element, mostly because of the focus of the double six. Because of their backwards movements Dortmund was always covering the way to their goal with four players. Gündogan and Bender were able to show their dynamism in transition. 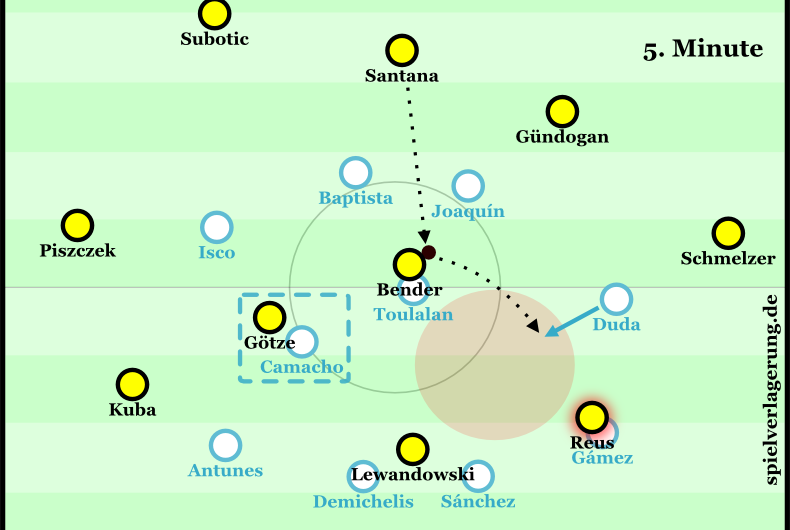 Bender was especially important, because he intelligently positioned himself to cover when Dortmund was still in possession. Malaga’s advanced wingers could have found space behind Dortmund’s advanced fullbacks more often, if not for Bender. However, the fullbacks did not advance too far, but played a disciplined game and returned quickly. Dortmund was able to use their sixers’ “hunter mentality” effectively this way. Playing Bender seemed to be a good choice, but Malaga’s go-ahead goal was influenced decisively by this aspect. Bender advanced too aggressively towards a second ball and Gündogan did not cover determindely. Joaquin’s shot came out of the the resulting space and he scored. Formations between minutes 30 and 62. After 30 minutes Jürgen Klopp changed formation. His team was supposed to develop more central presence within a 4-3-3. Blaszczykowski occupied the right side of the double eight and Götze occupied the right wing, from where he orientated himself more towards the middle than the Pole had done. At first the impact was not exactly great. 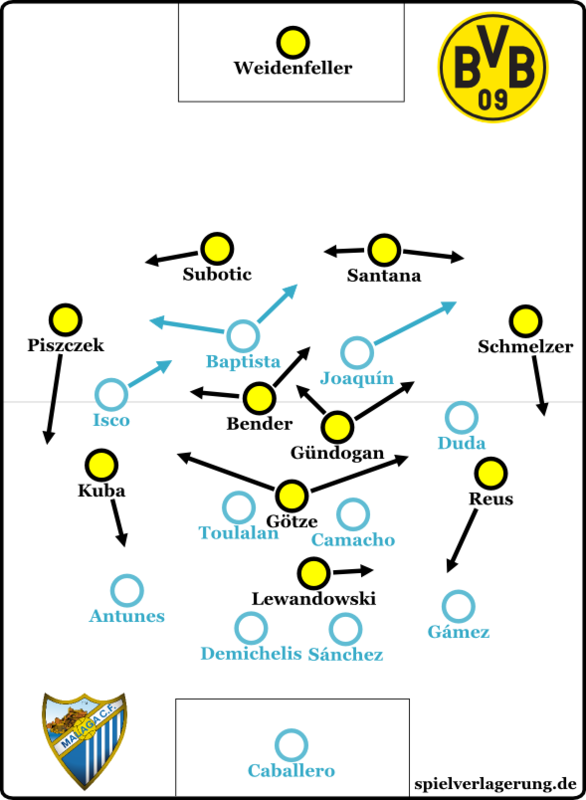 Götze and Gündogan were now seperated and Dortmund’s basic formation was a bit more stretched. Camacho and Toulalan were able to react well due to their free interpretation of their position. In addition Blaszczykowski had an off day and was the bottleneck at the centre of the 4-3-3. During the first half he only managed to get a miserable 7 of 21 passes to his team-mates, three of those on the left flank backwards. Dortmund distributed themselves slightly better across space than before and combined a bit better. Especially the right flank, not important up to this point, was now more alert and initiated the equaliser in the end, but it was the product of marvellous skill and had little to do with tactical factors. Real improvement could be seen after the break, when Dortmund’s players began to position themselves in centre and the half-spaces more consciously and intelligently. After a mere 90 seconds they were able combine through the overloaded left half-space and Lewandowski had a decent attempt. 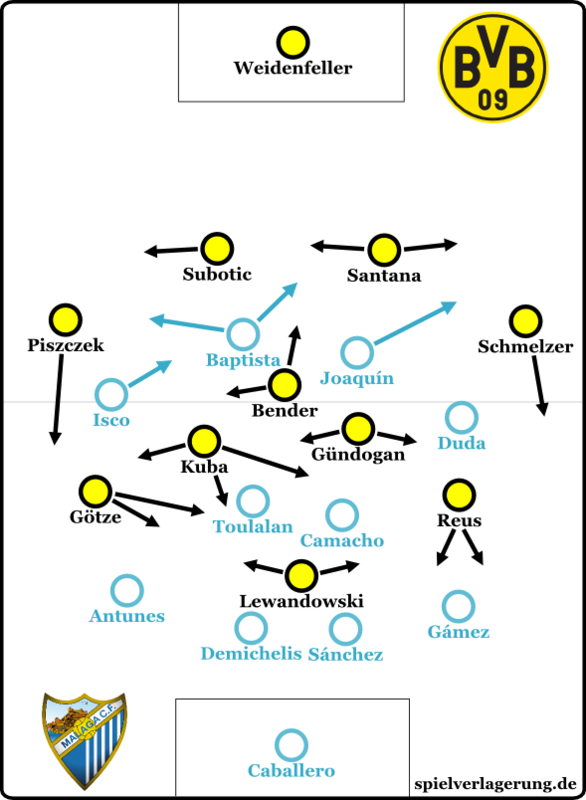 Following that, the forward dropped more frequently, Götze and Blaszczykowski were overloading the left flank and Dortmund seemed to control the game. The first fifteen minutes of the second half was the best spell by Dortmund from a tactical perspective, but they could not exploit it continually, because of growing impatience in possession. The quiet ball circulation without passing options in the beginning had been replaced by more and more passing options, which were passed on unnecessarily for speed. A few early long balls by the Dortmund centre backs gave away a lot of potential during this phase. Blaszczykowski and Gündogan run at the central spaces, where they outnumber the opposition with Psizczek. Bender covers for the right-back. Subotic does not wait for a clean pass, but sends Götze – without success, a wasted ball. Klopp returned to 4-2-3-1 in the 62nd minute. Later he justified the change with not wanting to introduce Sahin into the 4-3-3. Because of Schieber, introduced as the much more offensively minded alternative to Blaszczykowski, an option for the second eight was missing as well. The change did not bear fruit for the time being and until Sahin was introduced ten minutes later, Dortmund did not have another shot on goal. Lewandowski’s offside goal happened during this spell, but it was piecemeal, not possible without the advantage of being offside. The game entered a hectic phase with lots of back and forth without major advantages or longer spells of possession. Dortmund only got back into the game with Sahin. After only three minutes the play-maker directed one of his infamous diagonal passes towards Reus, who missed a sitter. In that moment Dortmund was able to exploit the advanced position of the fullbacks, Piszczek had run past Isco away from the ball. Another five minutes and Götze had a great opportunity, initiated by Gündogan, now playing higher up the pitch. Borussia was not able to control the game at all times during this phase, because Malaga fought back. They did not allow Dortmund to press them into their own half, instead they used their strong individual skill in attack to create relief attacks. They forced the home team to continually build up play from their own box this way and they ran down the clock. In addition the Andalusians dominated set pieces in both directions. While Joaquin missed two promising headers, they were able to partially use Dortmund’s free kicks and corners, which were now more frequent. After defended set pieces they focused play deep down the flanks and were able to create the odd chance on the break. During spells of possession they used simple long balls in behind the fullbacks to bind and push back as many Dortmund defenders as possible. As a consequence the game became more and more hectic and frayed, denying Dortmund the chance to find a dominant rhythm. Due to the time pressure they made more mistakes in build-up instead, making a few counter-attacks for Malaga possible. One of these opportunities, initiated by Isco, who played a strong second half, led to the 1:2. Borussia was hectic in defence during this scene, trying naively and desperately to regain control of the situation instead of slowing the attack down – a mistake often made by Borussia, especially in nervous moments. Approximate formations after the 87th minute. With a few minutes left on the clock and two goals needed, Klopp grabbed for the crowbar. The black-yellow crowbar was of course Mats Hummels. He was introduced to play long balls from the back, which Santana was supposed to retain up front. Even Subotic sometimes advanced as well. This crowbar tactic was not demanding, but at least Dortmund interpreted it exceedingly well. Of course Sahin and Hummels can play those long balls as well as anyone in the world, a good basis for this approach. 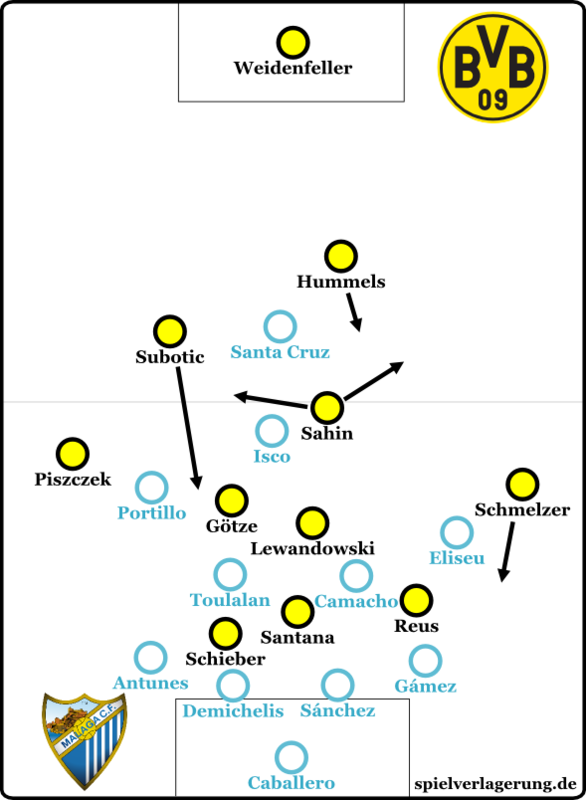 Dortmund’s formation did not dissolve into complete chaos either, as they maintained a good distribution for the second balls. Pisczcek and Schmelzer secured the flanks, Lewandowski and Götze speculated on ricocheting balls from Santana. Schieber and Reus went towards bouncing balls as well or passed directly. Malaga’s defensive centre and its surroundings were basically swamped, leaving Malaga unable to defend effectively against the rather simplistic kicking. Pellegrini tried to react with a formation change to 4-4-1-1 with Santa Cruz advanced to deny long balls directly, but Sahin and Hummels had too much space to dodge for that to work. Further developments due to this last-minute plan are already a fix part of football history. A kind of black-yellow mass hysteria, collective adrenaline rush, a singular moment for eternity. Football madness. The BVB advances to the semi-finals.